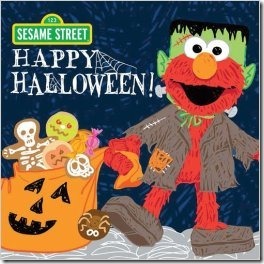 I’d like to share three new Halloween books for kids from Sourcebooks. 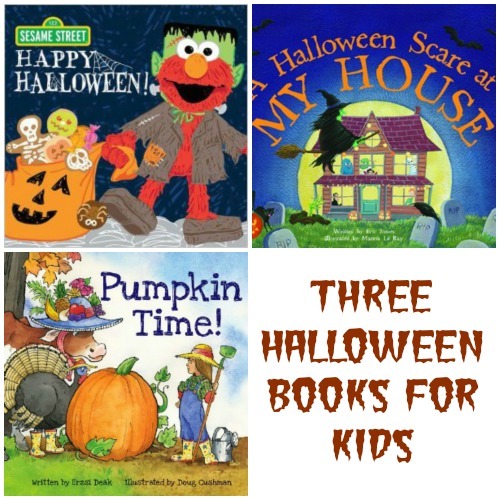 I love reading seasonal books with my kids so I’m always looking for new ones. I’d like to introduce you to these three books we received from Sourcebooks to try out and then I’d like to invite you to enter to win them yourself! I loved this book! Normally I see Elmo and expect a really young story like for a toddler but this book would be fun for even a preschooler or possibly older to read. Adult readers familiar with The Raven by Edgar Allen Poe will recognize the way the book is written. It obviously was inspired by the poem. It was very cute and enjoyable and I don’t think I’d mind reading it over and over and over again. This one is long but has a great ending. The boy talks about a scary tale he has to tell and goes on about all these monsters coming towards his house and what they were doing. They get closer and closer till they are in his house but at the end, he is surprised to learn that HE scared THEM. The pages are shiny (which I love) and so easy to turn. There are about 4 lines of text on each page and lots of words that might be new to your child depending on their age such as staggered, lurched, ravenous, hapless and bulging. 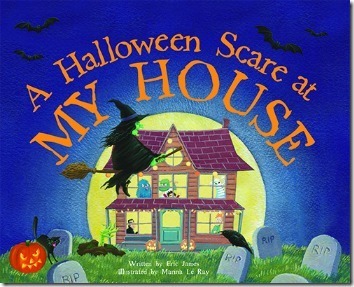 On the inside cover where they usually have a spot to write who the book belongs to, it says To _____________ This book invites you to a Halloween Scare. This one is more of a Harvest or Fall book than a Halloween book but it’s all around the same tine of year so it’s all good. Evy is so busy working in her garden she doesn’t notice everything going on around her throughout the year. On each page it shows what she doesn’t see/notice and then asks “What is Evy doing?” The back of the book has a page that explains what she’s doing so you can talk about what your child thinks Evy is doing and what you think and then go over it later if you want. 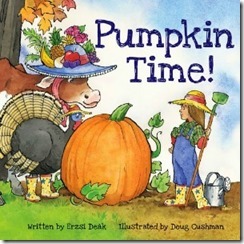 The back of the book also has some pumpkin facts and trivia and a recipe for toasted pumpkin seeds. The book would be good for an interactive reading experience with its open ended question. I must say though the things that are happening in the background, are often quite weird and I don’t really understand them. Sourcebooks is celebrating the release of these three titles by allowing me to giveaway the set of books to one winner from US/CAN.